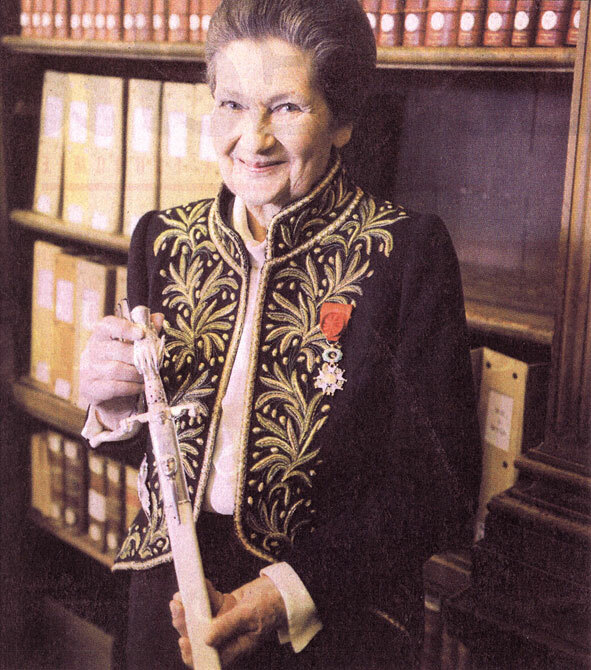 Simone Veil amongst the “Immortals”. Yesterday former minister and ex-president of the European Parliament Simone Veil has been admitted as a member of the “Academie française”. She has become an “Immortal”. She is also a death camp survivor. “My father who died in the Baltic countries felt admiration for French language [...] I think he would feel even prouder than I do, if he could see his daughter taking up Racine’s seat”, said Mrs Veil. From now on she will occupy the thirteenth seat that formerly belonged to the famous dramatist. No less than three presidents of the French republic attended the ceremony: Nicolas Sarkozy came after some hesitation. Valery Giscard d’Estaing was also present. He has been a member of the academy since 2003. Jacques Chirac was the one who handed in the ceremonial sword to Mrs Veil. Her prisoner number was engraved on the blade. Why didn’t they bring out the corpses of Mitterrand, De Gaulle and Pétain, so that they would have been able to enjoy the ceremony too? Let’s sweep away the absurd and slimy expression “anti-Semitism”. Let’s tell the truth. The right word to describe such a thing is Anti-Israelitism. Its Integral form was born 175 years ago (about 1835), WITH Zionism! Englishman Sir Moses Haïm Montefiore (1784-1885) and Frenchman Isaac Moïse Crémieux (1796-1880) were pioneers in this field. • On the right wing, setting up a base for Zionist mercenaries at Tel Aviv is seen as “a piece” of the Messianic Redemption! Alas, the chief constituent is missing: the Temple! • On the left wing, degenerated rabbis are seen as parasites that live on “the State”. Furthermore there are shameless whispers that… Hitler was the Messiah. This is the true face of Zionism: both barbaric-heathen and colonialist-racist. Of course, it has nothing to do with the return to Zion (CHIVAT TSIYYON = ) of Jewish people, a real Natural-Human planetary Revolution . Simone Jacob is now a member of the “Académie Française”! She was born in 1927 and she got married to Mr Veil in 1946. Lo and behold both of them come from the national upper-crust: Science Po and ENA; Finance and Armament. These “VIPs” are used to awarding the Legion d’Honneur and the Academic Honours to one another. Bonaparte (1802) and Richelieu (1635) must be turning in their grave at each go, but no matter! There is no doubt that Simone Jacob well deserved the Dominant Caste recognition, among other things, she is a Pillar of Zionism, then a devoted instigator of the True Pogrom. Translation from french – altered by the author – by Dorian. Given that PO-GROM means in Russian: Total Destruction. Let’s bet that (with the help of History) what Zionism MUST BE WILLING will fail. ZION is synonymous with Jerusalem ( ), that is to say it is “Temple-city”. NÈTOURÈY QART’Ā ( ) “the Small Rest” of Israel (SH’ÈRIT YSRA’ÈL = ).